When I am selling real estate in Idaho Falls with The Group Real Estate and Copper Creek Homes as the Bearded Realtor, I try and read peoples body language while I am communicating with them. I have been studying peoples’ body language in order to be able to provide them with the best service possible. Body language refers to the nonverbal signals that we use to communicate. According to experts, these nonverbal signals make up a huge part of daily communication. From our facial expressions to our body movements, the things we don’t say can still convey volumes of information. Body language is really hard to fake. Our words may not betray us but our bodies often will. You’ve probably run into this situation a few times: Your friend has to do something really nerve-wracking (job interview, marriage proposal, ask his boss for a raise, testify in court, etc.). You ask him if he’s nervous, and he confidently replies that he’s totally fine. His body language belies his confident words, however. His eyes are darting; he’s fidgety; he keeps looking at the door (perhaps his survival mode is kicking in and he’s taking note of all the potential escape routes). Clearly, there is a lack of congruence between what he’s trying to communicate, and what his body is saying. Learning to read and use body language is an important aspect of interpersonal communication. When we interact with someone, we are communicating with more than just words – our body talks too. Sometimes, in fact, our body language, facial expressions, and gestures will say a lot more than our mouth does! When William Shakespeare said that “the eyes are the windows to your soul,” he was certainly onto something. The ability to read body language is an important aspect of emotional intelligence and interpersonal communication in general. It has been suggested that body language may account for between 50 to 70 percent of all communication. Understanding body language is important, but it is also essential to pay attention to other cues such as context. In many cases, you should look at signals as a group rather than focusing on a single action. Here are some more about things to look for when you are trying to interpret body language. Think for a moment about how much a person is able to convey with just a facial expression. A smile can indicate approval or happiness. A frown can signal disapproval or unhappiness. In some cases, our facial expressions may reveal our true feelings about a particular situation. While you say that you are feeling fine, the look on your face may tell people otherwise. The expression on a person’s face can even help determine if we trust or believe what the individual is saying. One study found that the most trustworthy facial expression involved a slight raise of the eyebrows and a slight smile. This expression, the researchers suggested, conveys both friendliness and confidence. Facial expressions are also among the most universal forms of body language. The expressions used to convey fear, anger, sadness, and happiness are similar throughout the world. Researcher Paul Ekman has found support for the universality of a variety of facial expressions tied to particular emotions including joy, anger, fear, surprise, and sadness. Research even suggests that we make judgments about people’s intelligence based upon their faces and expressions. One study found that individuals who had narrower faces and more prominent noses were more likely to be perceived as intelligent. People with smiling, joyful expression were also judged as being more intelligent than those with angry expressions. Gestures can be some of the most direct and obvious body language signals. Waving, pointing, and using the fingers to indicate numerical amounts are all very common and easy to understand gestures. Some gestures may be cultural, however, so giving a thumbs-up or a peace sign in another country might have a completely different meaning than it might in the United States. How we hold our bodies can also serve as an important part of body language. 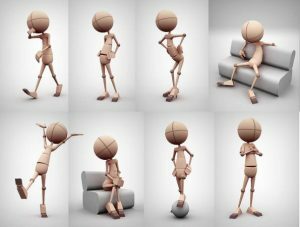 The term posture refers to how we hold our bodies as well as the overall physical form of an individual. Posture can convey a wealth of information about how a person is feeling as well as hints about personality characteristics, such as whether a person is confident, open, or submissive. Have you ever heard someone refer to their need for personal space? Have you ever started to feel uncomfortable when someone stands just a little too close to you? The term proxemics refers to the distance between people as they interact. Just as body movements and facial expressions can communicate a great deal of nonverbal information, so can this physical space between individuals. Understanding body language can go a long way toward helping you better communicate with others and well and interpreting what others might be trying to convey. While it may be tempting to pick apart signals one by one, it is important to look at these nonverbal signals in relation to verbal communication, other nonverbal signals, and situation. You can also focus on learning more about how to improve your nonverbal communication to become better at letting people know what you are feeling – without even saying a word.